Like I have said several times before in this Soundtrack: I love samplers! I know that many record collectors only go for original releases, and consider compilation LP’s as unworthy. But if it weren’t for sampler LP’s, I would never have heard half of the songs that are on my all time favourite list now. Many of the best compilation LP’s in my collection come from labels that have no address, if you know what I mean. I used to buy most of these records at Get Records and Forever Changes, two record stores that I visited at least once a week in the eighties and nineties. And I rarely left without a few LP’s. In the eighties and early nineties the amount of releases in this field was huge. And some records had a very limited edition, which meant that if you didn’t buy a copy immediately, you might never get a change again. 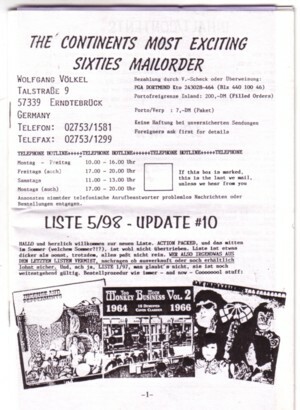 Later I got in contact with people that sold such records over the mail. Every few weeks I received photocopied lists, and the LP’s that I ordered were delivered within a few days. Maybe this analog network still exists, but I doubt it; the Internet made it so much easier to find everything. And although I still buy sampler LP’s, CD’s have replaced the LP even in this genre for the biggest part. I like CD’s too, but they are not the same as LP’s. 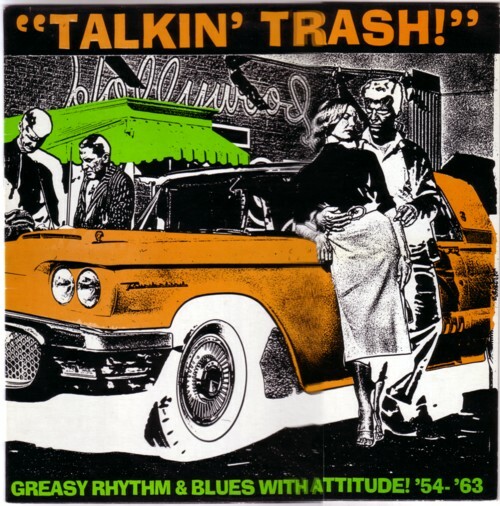 While I type this l am listening to Talkin’ trash , an LP with greasy rhythm & blues with attitude from ’54–’63 , released on the Greasy label. None of these 18 records were ever released in Holland, and I don’t think any were hits in the States, but man, what a killer songs! Highlights on this LP are Pigmeat Markham ( Your wire’s been tapped ), Morine & The Zercons ( Let a woman through ), Rudy Ray Moore ( Step it up and go ), just to drop some names. Compilations like these are much more than just a bunch of great songs from the same genre. In fact, it are very different songs from different genres, but with the same vibe, to use that much abused word. Gospel, comedy, blues, rock’n’roll, in the minds of the anonymous editors of this LP it all fit under the title Talkin’ trash . And they are right! Here is Reverend Lofton & The Holy Travellers with Look to Jesus . And please listen to the guy mumbling the bass lines! And here is Melvin Smith with Ugly George .